According to a combined study, from St. Mary’s Press with the Center for Applied Research in the Apostolate, approximately 13 percent of young adults between ages 18 and 25 are former Catholics. It also states that they desire a spiritual connection even though they do not consider themselves affiliated with the church. One way of encouraging a connection is to reach out to students on college campuses. Enter Megan Henle, Avery Hembrook, Michael Newsham, and Joey Fritz. 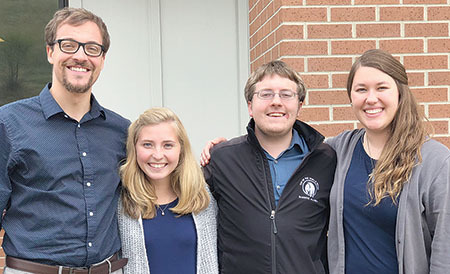 The four campus missionaries are part of the Fellowship of Catholic University Students, better known as FOCUS, on the South Dakota School of Mines and Technology campus, Rapid City. They are tasked with helping engineering, geology, math, and computer science students navigate college faith life through friendship, Bible studies, and mentorship. SDSM&T is one of 19 new FOCUS campuses this academic year. FOCUS is a Catholic outreach organization whose mission is to share the Gospel with college and university students. Missionaries are trained in church teaching, prayer, Scripture, evangelization and discipleship — inviting students to have a personal relationship with Jesus and accompanying them along the way. On the SDSM&T campus, it’s also about taking the analytical thought process of many of the students and connecting it to a relationship. “I had to go through the process of connecting of my mind and my heart in my relationship with God and I knew that would be a big thing here,” agreed Joey Fritz, a third-year missionary. Fritz majored in computer science at North Dakota State University, Fargo, N.D., and encountered FOCUS at a SEEK2015. He explained that faith was something he did out of habit until he heard a talk from Father Mike Schmitz at the yearly national conference presented by FOCUS. When the missionaries first arrived on campus, they helped students move in and attended campus events, Newman Center Masses and other happenings. After this initial outreach, missionaries begin to organize, facilitate, and train students to lead small group Bible studies. The goal is to bring students closer to Christ and to help students establish and/or deepen their relationships with Christ. “Through the Bible studies I was able to take an extra step and go a little deeper on a regular basis. I didn’t have anyone challenging me until that moment,” said first- year missionary Michael Newsham. He was active at his Newman Center at Washington State University, Pullman, Wash., but it was with the FOCUS missionaries who started on campus his third year that he began to understand his relationship with Jesus. Within those Bible studies, FOCUS missionaries welcome students into a discipleship program teaching them how to take the faith out to their friends, lead their own Bible studies, and teach others how to pray. Fellowship is also an important part of the missionary’s time on campus. Events have included formations nights, men’s and women’s nights, camping, and coffee with the students.